The laser ranging interferometer (LRI) instrument has been successfully switched on aboard the recently launched twin U.S./German Gravity Recovery and Climate Experiment Follow-On (GRACE-FO) satellites. The LRI, which is being flown as a technology demonstration, has made its first measurements in parallel with GRACE-FO’s main microwave ranging instrument, and initial comparisons of the data from the two types of instruments show that they agree as expected. 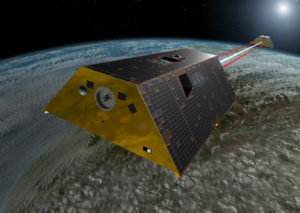 The GRACE-FO mission, launched on May 22, continues the work of the original GRACE mission of monitoring phenomena such as the melting of ice sheets and changes in groundwater levels by tracking the changing pull of gravity on the GRACE-FO satellites. The microwave ranging interferometer records these changes in gravity by measuring how they change the distance between the twin spacecraft. By accurately measuring these minute changes as the two spacecraft orbit the planet, scientists are able to calculate month-to-month variations in Earth’s gravity field. The LRI is an enabling technology for future GRACE-FO-like missions with potential to significantly improve the accuracy of those missions. The instrument is jointly managed by JPL and the Max Planck Institute for Gravitational Physics (Albert Einstein Institute) in Hanover, Germany. In the data that were downlinked the next day, it was clear that each spacecraft had seen several flashes of light during the spiral scans, indicating both LRI instruments received light from the opposite spacecraft and were working as expected. The settings needed to establish a continuous laser link were calculated and uploaded to the satellites, and the LRI delivered its first intersatellite range data at a later downlink that day. “The plan for establishing the laser link worked exactly as designed. In fact, the laser link locked in on the first attempt,” said Christopher Woodruff, the LRI mission operations lead at JPL. In the coming weeks and months, the GRACE-FO research team will work on fine-tuning the operation of this novel instrument and completing their understanding of the data it delivers. GRACE-FO is a partnership between NASA and German Research Centre for Geosciences in Potsdam, Germany. JPL manages the mission for NASA’s Science Mission Directorate. Additional contributors to the laser ranging interferometer include SpaceTech in Immenstaad, Germany; Tesat-Spacecom in Backnang, Germany; Ball Aerospace in Boulder, Colorado; iXblue in Saint-Germain-en-Laye, France; the German Aerospace Center (DLR) Institute of Robotics and Mechatronics in Adlershof and Institute of Space Systems in Bremen; Hensoldt Optronics in Oberkochen; Apcon AeroSpace and Defence in Neubiberg/Munich; Diamond USA, Inc., and Diamond SA in Losone, Switzerland; Airbus Defence and Space in Friedrichshafe; and The Australian National University. Send site comments to the Center for Space Research.